Your best source for quality, American-made mailboxes at the best prices possible is U.S. Mail Supply. We regularly ship mailboxes to Ohio, as well as throughout the United States. 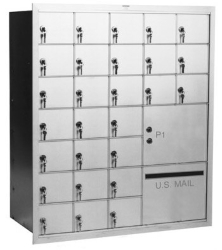 U.S. Mail Supply carries many lockable indoor 4C mailboxes and outdoor pedestal mount mailboxes for businesses, multi-tenant buildings and institutions. In addition to contemporary styles, we also have decorative pedestal mount mailboxes in a range of colors to complement older buildings. USPS approved 4C Horizontal mailboxes are the standard for mailboxes installed in a central location. These are usually recess mounted, but can be adapted for surface mount. They’re available in a variety of colors and door configurations to meet just about any need. The United States Postal Service has strict regulations for mailboxes, so if you’re installing mailboxes for mail delivery you need to be sure you’re ordering USPS Approved mailboxes. You can be confident any mailbox we represent as being USPS Approved is indeed USPS Approved. Apartment mailboxes take a lot of abuse, so it’s important to have mailboxes that will hold up. Our selection of indoor and outdoor mailboxes is built to withstand both the ravages of inclement weather and daily use. Available in a range of architectural colors to blend in with any color scheme. Whether you need mailboxes for a small, multi-tenant building or a large office park, U.S. Mail Supply has them. 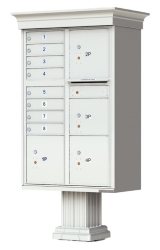 Our pedestal mailboxes are available in a wide range of door and slot openings, and can be configured with package lockers for larger deliveries. 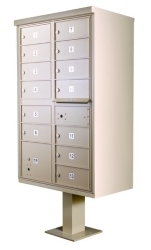 The horizontal and vertical mailboxes we carry can all be custom ordered with the exact number of slots you need for the occupants of your building. 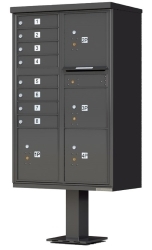 They’re also available with several locking options to keep mail secure, as well as lockers for larger deliveries. 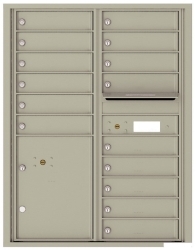 U.S. Mail Supply has both traditional post mounted mailboxes for curbside delivery and wall mount mailboxes for residential use. You can find inexpensive plastic mailboxes at your local big box store, but a quality mailbox from U.S. Mail Supply will outlast any of them. 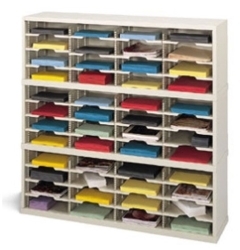 U.S. Mail Supply has a great selection of mail sorters and literature organizers. These are not only great for mail rooms, but also for anywhere else you need to organize or file documents, pamphlets and other printed materials. We even have secure sorters for HIPPA compliance. 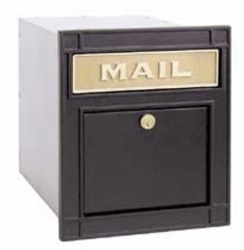 Our inventory of steel and aluminum mailboxes includes horizontal and vertical mailboxes (wall mount or recess mount), decorative pedestal mount mailboxes, drop boxes and key holders. In addition to USPS approved mailboxes, we also carry private use mailboxes for in-house mail distribution. Heavy-duty metal construction keeps mail and belongings secure. Mailboxes not only have to endure rain, high humidity and, in areas close to the ocean, corrosive salty air, they also have to withstand the attempts of thieves to steal mail. 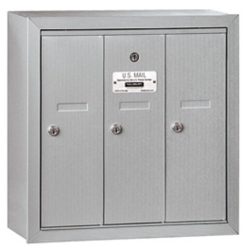 All the mailboxes we carry are built with steel or aluminum to ensure they hold up in adverse conditions. Choosing a mailbox isn’t as simple as it might seem. With so many options for how mailboxes can be configured, and the various locking options available, you’ll inevitably have questions. We’re here to help, just give us a call. U.S. Mail Supply has on-staff design assistants to help ensure you get the perfect mailbox for your application. Just click on the type of mailbox listed below and enter your responses to the questions. After we get your responses, our design staff will work up a rendering of how your new mailboxes will look and provide you a quote.